Recently declassified documents obtained by the National Security Archive reveal that the Kennedy and Johnson Administrations were considering military action to prevent or delay China from building nuclear weapons — even if that meant working with Moscow to stage an accidental bombing. The pertinent document is the June 21, 1963 entry in the journal of Glenn Seaborg, who was chairman of the Atomic Energy Commission from 1961 to 1971. Seaborg describes a White House meeting on the nuclear test ban negotiations with the Soviet Union. The discussion then turned to China — which had refused to support a test ban treaty — when President Kennedy asked how the U.S. might handle the issue in the Moscow talks. William C. Foster, the director of the Arms Control and Disarmament Agency, confidently observed, "if we could get together with the USSR, the Chinese could be handled even if it required an accidental drop on their facilities." The reference to an "accidental drop on their facilities" was excised when the diary entry was published in the Foreign Relations of the United States but it was declassified through a request to the Department of Energy for a new review of the document…. just how the United States or even the Soviet Union could have staged such an event in the interior of China, where Chinese nuclear facilities were located, is an interesting problem…..In any event, Foster's statement is one more bit of evidence that senior officials were interested in the possibility of taking action against the Chinese nuclear program, even to the point of arranging an "accidental" bombing with Moscow. 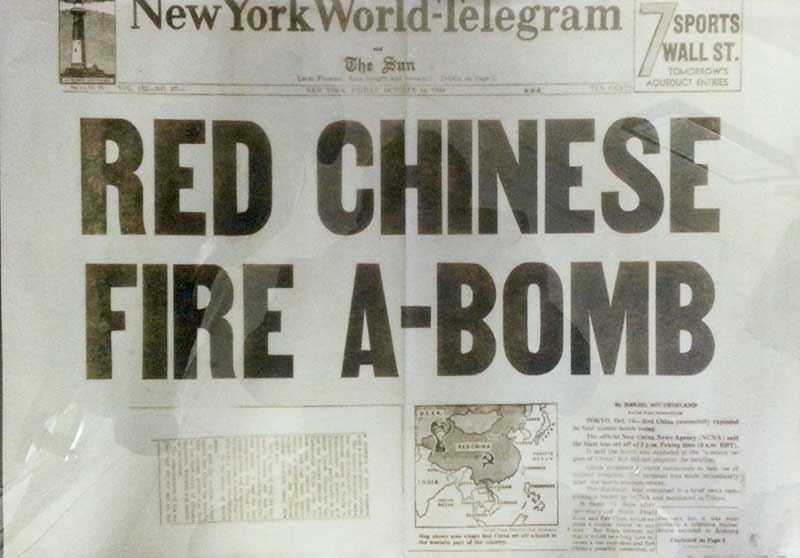 A few years later, the U.S. dismissed the idea of bombing China. There were too many risks: Military action could prompt Chinese retaliation against Taiwan or other U.S. allies in East Asia, entangle the Soviets (who were unwilling to join in such an attack) and reduce the prospects for arms control initiatives to constrain China. President Johnson concluded, "Action with no justification other than a general argument that the U.S. was seeking to preserve the peace of the world through depriving a potential aggressor of nuclear weapons" could not be defended.